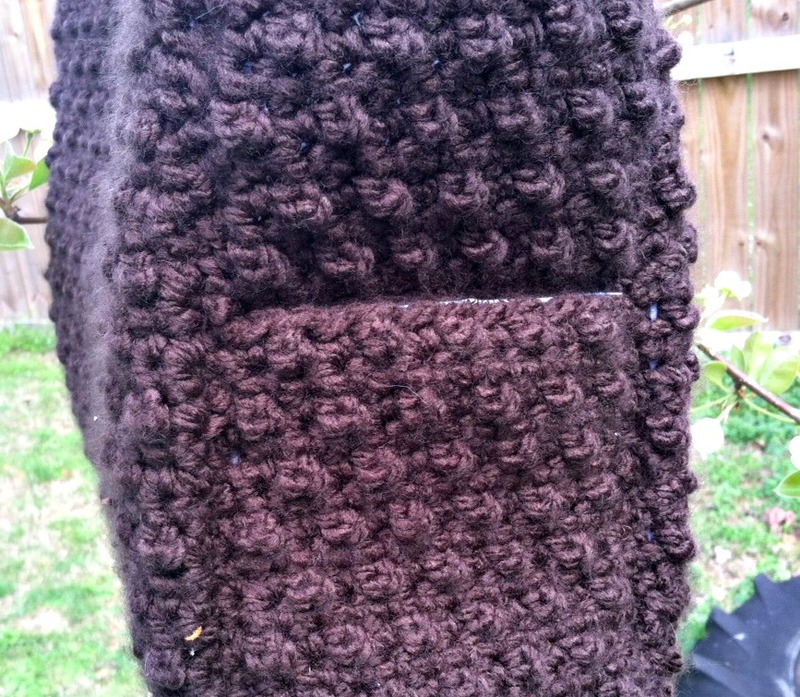 Chocolate Tote - Free Crochet Pattern - love. life. yarn. Hello everyone! I am so honored to be a part of Crochetville’s National Crochet Month Blog Tour again! This is the second year I have participated in the tour and it is a great way to learn about crochet designers, products, yarn companies, and more! If you’re here and you haven’t checked them out, head on over to Crochetville and see the other featured designers. A big thank you goes out to Amy and Donna for putting this all together! For those of you who don’t know me my name is Amanda Saladin and I have been running this blog, Designing Crochet, for almost four years. Designing Crochet merged with my knitting site in November 2016 and became AmandaSaladin.com. I have been designing crochet items for a few months longer than that and love what I do. I am a full-time high school teacher in middle Tennessee and I teach nutrition and fashion design. I have been happily married for over 12 years and have three amazing little boys, ages 6, 3, and 7 months. If you stopped by last year on the tour you know we were expecting again but didn’t know the gender – then our third boy arrived in August! I also design knitwear but have focused mostly on crochet until recently. I’m still crocheting, but am knitting, too, and also working on tutorial videos, more free patterns, and how-to articles for this blog. It’s a busy life! For this year’s blog tour I created a textured handbag that works up very quickly and is easy enough that someone starting out could create it. I’ve been working hard to add free patterns to my site and so far most of them I have made for people who don’t have a lot of crochet experience, or those who do and want a quick project. This bag fits the bill! The lining and handles take a little time, but are optional. You could easily do a crocheted handle if you prefer. 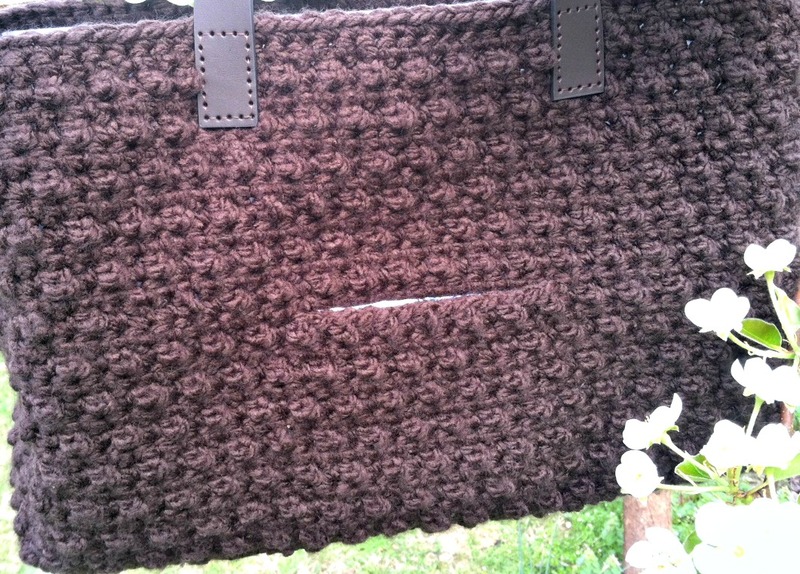 I think a fabric lining and purchased handles really give crochet and knitted bags a professional touch, and tend to use them often when I make a bag. So, here it is! Hope you enjoy this free pattern! Extra Extended Single Crochet (eesc): Insert hook into st and pull up a loop, (yo, pull through one loop on hook) twice, yo and pull through all loops on hook. Row 1: Sc in 2nd ch from hook and each ch across; turn – 13 sts. Rows 2-14: Ch 1, work even in sc; turn. Row 1: Sc in 2nd ch from hook and each ch across; turn – 39 sts. Row 2: Ch 1, sc in next st, *eesc in next st, sc in next st; rep from * across; turn. Row 3: Ch 1, work even in sc; turn. Rows 4: Ch 1, sc in first 2 sts, *eesc in next st, sc in next st; rep from * across to last st, sc in last st; turn. Row 5: Ch 1, work even in sc; turn. Rows 6-13: Repeat rows 2-5. Row 15: Ch 1, sc 13, sc across 13 sts of top of pocket lining, sk 13 sts of front, sc last 13 sts of front. Rows 16-17: Repeat rows 4-5. Rows 18-25: Repeat rows 2-5. Rows 26-27: Repeat rows 2-3. Row 1: Sc in 2nd ch from hook and each ch across – 13 sts. Rows 2-17: Work even in sc. Rows 18-25: Repeat rows 2-5 of front. Rows 26-27: Repeat rows 2-3 of front. Each side has a pocket, too! Rows 2-17: Repeat rows 2-5 of front. Rows 2-41: Repeat rows 2-5 of front. Sew side pocket on top of side at sides and bottom. Sew pocket lining to front/back at sides and bottom. Stitch front and back to sides. If you need help with the stitch pattern, check out my newest tutorial video. 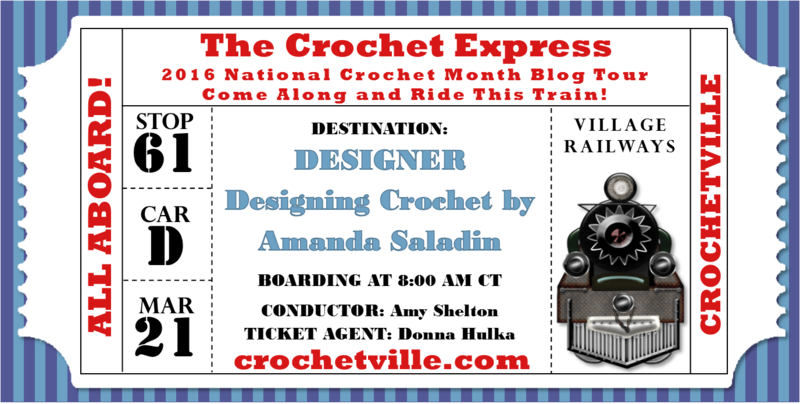 Thanks for checking out AmandaSaladin.com and I hope you enjoy the rest of the stops on the Crochetville Blog Tour! I would love to hear from you – leave a comment below! I love this pattern and I really want to make it but I am not able to print it. The pattern is not fitting the page and I don’t know what to do. Please help! Thanks! I would like printed version also.. This pattern is available to view here on the website or you can buy a downloadable version on etsy for $1.99. This little bit helps support my site and pay for hosting. The free pattern is always available here on the site. 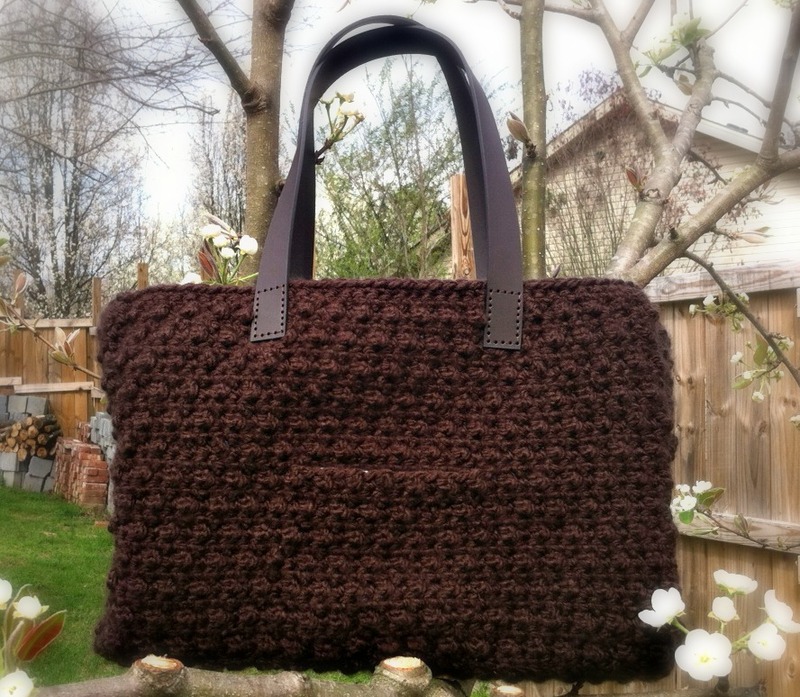 I like this bag, would like to make it when I get some chunky yarn. Thanks for the pattern! I am not understanding row 15 of the front. If you could explain it a little more for me please that would be great. I have already started it and would love to finish. Thank you. Hi Amy! When you work row 15 you are making the pocket. To do this you will need to leave the center 13 sts unworked and instead work the 13 sts from the pocket lining. I added an image to the bottom of this post to see if it explains it better. Let me know if you have any other questions! Got it the picture helped. The sk 13 sets of front part was what confused me but thank you very much for your help. This looks like just the bag I’ve been looking for. I’m a little confused about the pocket “liners”. Do we attach the tops where it says to att ach the pocket liners? Is everything else then sewn on and see together when all the sides are done? Hi, did you receive my pictures. Thanks. When you have a printable version of this pattern I would love to be notified about it. I’ve never used stabilizer and wonder how to use it and when? Check out the lining tutorial for this project – it shows you exactly how and when to use the stabilizer. It is really the difference between a floppy bag and one that will hold its shape. I would love to see this pattern on Youtube. Do you have a YouTube page where you can video the stitches and pattern? I cannot follow the written directions. I have a short tutorial on youtube for how to complete the stitch pattern, but not a tutorial for the whole bag. You can view that tutorial here. Hi Mary! I used two techniques to sew this bag together, but either one would work fine. I started out with putting the right sides of the bag together and slip stitching the seams with the same hook and yarn used for the bag, but then I used a whipstitch with yarn and yarn needle and it worked just as well! I have a lining tutorial and it shows me sewing it together and even if you choose not to line it there are pictures of the sewing part. 🙂 You can view it here. Hope it helps! I’d love to see pictures of your bag! Thank you, the tutorial looks to be a good help. Sorry I didn’t look at it sooner. I appreciate your time. I hope to be able to send you a picture. Be well! I have received several questions about row 15 and further down the post I have a picture and a more detailed description. You are working 13 sts of the body of the bag then working the 13 sts across the pocket lining instead of the next 13 sts of the body of the bag (you leave those unworked). Then continue across the 13 sts remaining of the body of the bag. It leaves the center 13 sts open to become the pocket. Hope this helps! 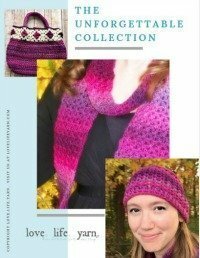 The pattern is available online or you can pick up an ad-free downloadable version on etsy if you would like for $1.99. This little bit helps support the cost of running the website but I always offer the full free pattern here on the blog. Hi I love this tote! Question: the pocket liners are in single crochet and they don’t match the bag, but the pictures look like they were done in the stitch pattern (rows 2-5). Should they be done in the stitch pattern or am I reading the liners section wrong?